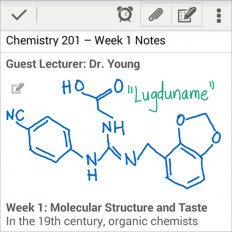 Handwriting for Android has arrived in Evernote (for Android). When Evernote acquired Penultimate (for iOS), iPad users who were still relying on pen-based input had a way of incorporating those hand-written notes into Evernote. That's exactly what I did. Now, Android users can add handwriting into new notes or existing notes. I'm sure that medical students and residents will certainly appreciate this feature. When you're standing by a patient's bedside, it's much easier to scribble a note than to use the on-screen touch keyboard to enter information. I'm still waiting for Evernote to add this handwriting feature for tablets running Windows 8. On a Windows-based device, you can either type a regular note (no handwriting) or you can create an Ink Note (handwriting only and no typing). You can't add handwriting into a regular typed note. Windows users may gravitate towards using Microsoft OneNote (which is what I used to use heavily back in the days of Windows XP Tablet), but I now use multiple devices (including iOS and Android) and that's why I use Evernote. I need to access all my notes across all my devices.